Keystone jack passively transmits RCA composite video and audio up to 1000 feet via CAT5 cable. Keystone jacks eliminate clutter for your RCA and composite needs and extend devices over long distances via economical CAT5E cable. Passively transmit RCA composite video, stereo audio or coaxial digital audio over CAT5 cable up to 1000 feet. Frequency response: DC to 220MHz. Female RCA composite video and stereo audio or digital coaxial audio, 75 ohm. 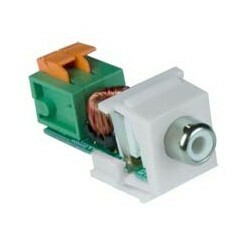 RJ45 terminal block 2 pin.